Am interested to know more about balloon drop and net and how they are released specially at a wedding and birthday parties both indoors and outdoors. Are they helium or air filled balloons? Is there a coloured book of balloon decorations images that I can buy? I intend to start a balloon business. Comments for How can I make a balloon drop for a wedding and is there a way of releasing them? 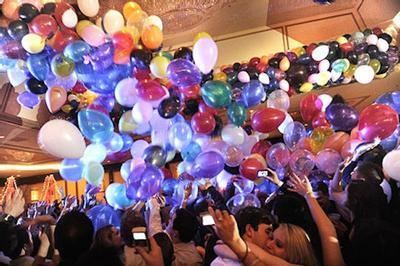 For a balloon drop you either need a specialised bag or net, and between 100 and 400 air filled latex balloons, depending on the size of the net and the size of the balloons. Typically 5 inch or 9 inch balloons are used. The net or bag should come with ceiling clips and a release cord. Here's a nice example of a balloon drop kit, complete with bag and 100 latex balloons. Video Course Balloon Decorating For Parties and Events: A 3 hour video course with 23 lessons geared towards beginners. The instructor, Peter J. Smith, walks you step by step through the basics of working with balloons and shows how to create bouquets, arches and columns. Price: $49 (Watch for special promotions from Udemy, the platform where the course is hosted). Balloon Decor Master Series, Conwin Online: A complete training set with 3 DVDs, 24 portfolio images and links to latest trends, tips and products. Price $165. QBN Balloon Kits, Qualatex: A three part training series with DVDs, the Qualatex catalog, online reference material and tests to become a "Certified Balloon Artist." Price $249. A balloondrop is balloons falling down from the ceiling. This is usually done with a net construction. Balloons are filled with air or nitro. When you fill balloons with helium they go up and will not fall from the ceiling.